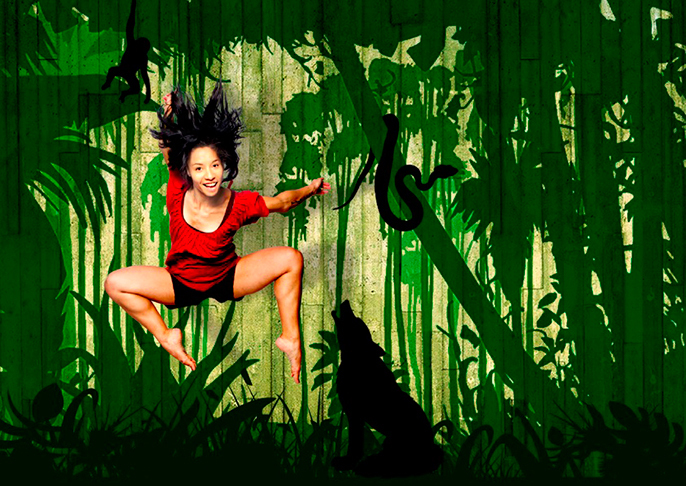 This spectacular new production from the award-winning Metta Theatre brings Kipling’s classic tale crashing into the 21st Century with breathtaking street dance and circus. Mowgli is finding her way in the urban jungle. With a beat-boxing bin man Baloo, graffiti artist Bagheera and a skateboarding Wolf crew, this heart-warming coming of age story will astonish and amaze. Choreographed by Kendra J Horsburgh (BirdGang Dance Company, Into the Hoods, Sadlers Wells and Blaze, International Tour) and featuring jaw-dropping tricks from an extraordinary cast of international performers, and adapted and directed by Poppy Burton-Morgan (Metta Theatre, Mouthful, The King of Tiny Things). Metta Theatre are known for their powerful visual storytelling and exploration of multi-cultural stories often from a female perspective. In JUNGLE BOOK we follow Mowgli on her search for identity and belonging - vulnerable, isolated and trying to find her place in an alien environment. The story transcends boundaries and will resonate with audiences young and old, urban and rural. Sound artist Filipe Gomes has created a beat-driven score using real world sounds of the city. Add to this designer William Reynolds’ trademark minimalism and an urban jungle is created – a stark forest of streetlamps disguising circus equipment on which these recognisably human animals cavort and contort themselves. The show uses street dance and circus to explore the search for identity and belonging in contemporary multi-cultural Britain. The diverse and multi-skilled cast includes the UK's leading dancers and circus performers. Acclaimed dance trapeze artist Natalie Nicole James plays Mowgli, both Kloé Dean (Bagheera) and Dean Stewart (Shere Khan) are also members of the leading streetdance company Boy Blue and specialise in a wide range of dance styles including Krump, Popping, Breaking and Hip Hop; trapeze artist Nathalie Alison (Kaa) is an emerging trapeze prodigy - the youngest cast member at just 21; Stefan Puxon (Baloo) and Matt Knight (Akela) have extensive credits including appearances with Pixie Lott, Will Young, Beverley Knight, David Hasselhoff and Robbie Wiliams, and dancer Ellen Wolf (Raksha) recently performed in the James Bond film Spectre and is a member of Birdgang Dance.